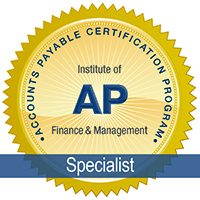 The Accounts Payable Specialist Certification Program (APS) covers AP fundamentals, best practices and compliance, all of which are necessary to excel in the accounts payable field. This program includes the e-textbook, video recording of a full-day training, practice quizzes and three attempts at the final exam. Enrollment expires one year from date of purchase.